Agharta wrote: I've seen plenty of reviews showing that the 140W TDP i9 parts are capable of consuming much more power than that at stock speeds and when over-clocked the power consumption jumps dramatically. As I say, it's improved over time as the chips and firmware support has improved. The problem at launch is that most people (reviewers and us builders) get very little time to test and optimize pre-launch, Normally 10 - 14 days would be seen as an absolute win, although in the case of that last launch it was more like 5 - 10 days if you were lucky! In an ideal world, we'd all get plenty of time to tweak and test our overclocks and even stock settings. I realised after launch that the settings both advised to me by Intel and the tweaking I did prior to launch, didn't take it quite as far as it would go voltage wise. Since then I've found myself able to bring the core voltages down a bit more where we can and the average temps I'm seeing have certainly improved. We expect to see changes to the BIos auto & default settings too over the first few months and this tends to translate into improved temps too. For instance, on the launch chips I was seeing a 140w at stock idle raising to 160w under load and maybe 170w post minor overclock. The i9's were more like 165w idle, 175w pushed and 190w minor overclock. I think myself (and most other people I spoke to pre-launch) were running about 10% higher voltage wise than we'd use on the current chips, if only because the first few batches wouldn't overclock without it but that has improved over time, bringing the temps down along with it. Well, maxing out your ASIO, should pretty much fully load your CPU too in a perfect scenario. Running a CPU torture test should at least give you a worst case scenario, although you'd rarely if ever hit it. Yeah, that would be the perfect scenario! My early testing on the i9's was avx based and it melted the system. I had a long conversation with a few developers who laughed at my concern regarding AVX and audio. So, my concern was lessened by those chaps, and to be fair I've had zero negative feedback with AVX issues since launch. I'll do it in general when loadtesting with AIDA or OCCT, but I haven't done a daw specific test with it for quite a few years. That was my concern, I wasn't sure if you'd have the invoice details or would only have the linked personal details. Well located! I'm still using the dark power PSU's, although the newer version, with the improved fan, so that should be fine. The noise levels on the cooler (bequiet) and the ARchon you have there are similar too, so also shouldn't be a concern. Case fans on yours are the Fractal basic model that ships with it. Reasonable noise levels with them, but not overly efficient. I'd certainly look to upgrade them for an i9 build, as they won't hold up to shifting that much heat. I use the Bequiets up to around the entry level i9. Above that, I use the N.v.v's. The Bequiets are quieter in general and move a fair amount of air. The N.V.V's are about as loud as your current Fractals but easily shift twice as much air, so preferred for cases that need to vent efficiently. Thanks Pete for the detailed reply. Always good to read your informed posts even if I don't agree with you 100% of the time. I noticed years ago that some motherboards were over-volting the CPU even if you didn't manually over overclock. This was Asus or Gigabyte and you had to manually change a BIOS setting from Auto to Stock or some such. I never liked that as a default as Intel test and set the voltage and I feel that should be respected. I would like to see reviewers use Intel's Vcore values at stock speeds. I noticed that AVX512 can process 32 bit data types so in theory it could be used to accelerate audio tasks. I am not clear what type of operations it works with though so do you know if it handles those that are relevant to a DAW? Agharta wrote: I noticed years ago that some motherboards were over-volting the CPU even if you didn't manually over overclock. It is respected in the way that it was designed. VID is a table with many values and the CPU will request a voltage within this table to run at the set frequency. This is a reason why at 'stock' (which isn't necessarily the motherboard's defaults), each core will be running at a different Vcore because that's the voltage required for stability at those speeds. There is no exact voltage for, say, a 7900x's Vcore. Instead there is the VID table. As for actually respecting each CPU's requested Vcore from the VID table, i don't necessarily agree because the requested Vcore can often be higher than is necessary due to the need to accommodate lower end motherboards that will have higher (or even severe), Vdroop/drop, and because of this higher Vdroop a higher Vcore is necessary for stability. On better gear you don't suffer so much droop so a higher initial voltage is unnecessary and, personally, i would put it in the bad points column. For example, the requested Vcore on one of my 7900x's cores under turbo boost was 1.37V. However, it can run 4.5GHz at 1.15V and 4.8GHz at 1.25V, which is currently where it's at with adaptive voltage. So it's running at a higher speed and at lower voltage than it would be if the user wasn't in charge. As for motherboards auto overclocking the hardware as some kind of feature i would agree that the default setting should be off, not on. Very informative discussion. It's not often you hear people talking about CPU core voltage draws. I mean a VID...of course there's a VID table, but it just never occurred to me to think about it. Thanks Pete. Really interesting. All sounds good. Can I get in touch with you via email when I'm ready to order ...to thrash out the spec? job wrote: It is respected in the way that it was designed. VID is a table with many values and the CPU will request a voltage within this table to run at the set frequency. This is a reason why at 'stock' (which isn't necessarily the motherboard's defaults), each core will be running at a different Vcore because that's the voltage required for stability at those speeds. There is no exact voltage for, say, a 7900x's Vcore. Instead there is the VID table. Intel has been using multiple voltage/clock steps (SpeedStep, EIST etc) since the last century for those new to this area. They do define actual voltages which is what I am referring to here and in this case as we are only interested in the voltage used for the highest clock speed as the context is maximum power consumption this single voltage is the relevant one. It is an exact voltage that is hard coded into the chip after validation/testing and varies chip by chip but will fall within a given range. job wrote: each core will be running at a different Vcore. Do Intel define a different Voltage for each core now at the same clock speed or is that just the ambiguity of language? I thought they were still using one voltage per clock speed for all cores. I mean when multiple cores are running at the same speed and not when a single core is being boosted via the TurboMax facility. job wrote: There is no exact voltage for, say, a 7900x's Vcore. Instead there is the VID table. Which is a table of exact voltage values. job wrote: As for actually respecting each CPU's requested Vcore from the VID table, i don't necessarily agree because the requested Vcore can often be higher than is necessary due to the need to accommodate lower end motherboards that will have higher (or even severe), Vdroop/drop, and because of this higher Vdroop a higher Vcore is necessary for stability. On better gear you don't suffer so much droop so a higher initial voltage is unnecessary and, personally, i would put it in the bad points column. Reviews rarely look at under-volting CPUs which is in effect what you are doing if running lower than spec settings. I have enjoyed under-volting desktop CPUs since around 2002 starting with the Pentium Northwood chips and it has really helped with keeping noise levels in check more easily. But I think reviews should be focusing on running the chips at stock settings for the bulk of the review and if they over-clock there is an importunity to look at non-stock settings. The review sites when looking at new high end CPUs as being discussed here will be using decent quality boards so the power delivery is usually up to the job. I don’t see why a quality board with decent power delivery should over-volt the CPU by default! If manufacturers want to release cheap low-quality boards that over-volt by default out of necessity then that is something I’d expect any half decent review to comment on. But I think that is possibly running out of the specification for the system anyway if the Vdroop is so bad that it requires over-volting at the BIOS level. But again, that’s a different class of board which you tend not to see in reviews of high end chips. I like to see under-volting but there isn’t the interest in it that is seen with over-clocking so you rarely see it in reviews. There is one way to sometimes get a sense of how well a chip might under-volt by looking at how it over-clocks. Some chips are binned very aggressively meaning that they ship with very little headroom for over-clocking. To achieve this often means pushing the maximum VCore to a level that is outside the optimal efficiency range. As power consumption is roughly related to the square of the voltage and directly to the frequency it’s much more important to keep the voltage low than the frequency with all other things being equal. As these chips have been pushed close to their limit that tends to mean the voltage has had to have been pushed uncomfortably high to reach a desired frequency. So if you back off the clock speed by 5 to 10% which should allow a lower voltage the overall power consumption can drop by 20% or so for a small loss of performance which puts you back in the optimal efficiency range. As you noted you have been successful under-volting at stock speeds also. Did you measure the power saving when doing so? I tend to use that as my ultimate reference as I trust my power meter more than software readings. It’s usually chips that are underwhelming that have this issue as they need to be pushed hard to try and compete with a competitor’s superior product. AMD has had this issue with their GPUs for a few generations now and they under-volt very well apparently. So based on the high power consumption of the Skylake X series they might well be ripe for under clocking/volting. job wrote: As for motherboards auto overclocking the hardware as some kind of feature i would agree that the default setting should be off, not on. I imagine the reason why some manufacturers over-volt by default is because they also set the Turbo Boost out of spec by default. They set it so that the maximum turbo boost speed which by design is usually only rated for 1 core is allowed for all cores. To compensate for that they need to increase the maximum VCore. Agharta wrote: They do define actual voltages which is what I am referring to here and in this case as we are only interested in the voltage used for the highest clock speed as the context is maximum power consumption this single voltage is the relevant one. It is an exact voltage that is hard coded into the chip after validation/testing and varies chip by chip but will fall within a given range. I'm not sure i understand how this argues with what i said. Yes, any specific core of a CPU will request the voltage it needs to run at a given frequency, and this requested voltage will be a value found in the VID table. Yes, the voltage needed (and therefore requested), has been previously determined and coded into the CPU. You think (i think), that this voltage should be honoured. I disagree, and i gave an argument in the previous post. There are also other settings, such as a sensible LLC, that can be incorporated to obtain stability that are arguably better than a higher Vcore. A higher voltage will lead to a higher current which will lead to more heat. None of which is a (long term) consequence of a sensible LLC. Agharta wrote: I thought they were still using one voltage per clock speed for all cores. I think you're conflating Vccin with Vcore? Vccin is what's delivered to the integrated regulator, which in turn delivers to the other parts of CPU; the cores, the memory controller, etc. Vcore is as its name implies, and can, and does, vary between cores at any given frequency since each core requests the voltage that it requires for stability at that frequency. Why would a CPU have as many Vcore values as it has cores if one Vcore value would suffice? Can different cores on the same CPU request the same voltage for the same frequency? Sure. Can they request different votlages? Sure. What matters is that whatever this voltage is is in the VID table, and as long as the voltage is in the table it is therefore be 'in spec'. As for a direct answer to your question... I honestly don't know when or if a single Vcore was hard-coded in a multi-core CPU. I can't recall any but that doesn't mean much. There is no exact voltage for, say, a 7900x's Vcore. Instead there is the VID table. Fair enough, let me rephrase. There is no definite, single voltage for all the cores of a CPU. We can make it a definite, single voltage if we wish, and many people do. Agharta wrote: ...under-volting CPUs which is in effect what you are doing if running lower than spec settings. Technically, under-volting (or over-volting), is using a voltage which is below (or above), that found in the VID table. As such, i'm not under-volting my CPU. 1.25V could actually be considered on the high side, but my cooling is up to the task and it's also running adaptive voltage so it only gets given 1.25V when it requests it, i.e. at high load, so all is well. Yes, you may be right. Although i think board manufacturers impart their own settings on things by default for the sake of performance; if you've got 3 boards for the same platform from 3 different manufactuers and 2 of them score X in various benchmarks and the other scores X+1 then the X+1 board will be perceived as better. job wrote: I'm not sure i understand how this argues with what i said. Yes, any specific core of a CPU will request the voltage it needs to run at a given frequency, and this requested voltage will be a value found in the VID table. Yes, the voltage needed (and therefore requested), has been previously determined and coded into the CPU. We may be talking at cross purposes as I have been commenting on the reviews of CPUs and how they should be conducted to give a good indication of typical real world usage using the stock settings. As soon as you venture off into fine tuning multiple settings then that is a whole other ball game. job wrote: Vcore is as its name implies, and can, and does, vary between cores at any given frequency since each core requests the voltage that it requires for stability at that frequency. Why would a CPU have as many Vcore values as it has cores if one Vcore value would suffice? “The voltage is optimised based on the selected frequency and the number of active processor IA cores. Once the voltage is established the PLL locks onto the target frequency. So to bring it back on topic which was looking at the power consumption of a CPU when fully loaded there is only one voltage that matters as that is the one that is hard coded and is used for all cores under a full CPU load. All the other stuff relates to power savings which have no bearing on the full load state. Keep in mind that it’s not that unusual for DAW users to disable the power saving states anyway to keep responsiveness at optimal level. job wrote: Fair enough, let me rephrase. There is no definite, single voltage for all the cores of a CPU. We can make it a definite, single voltage if we wish, and many people do. For the purpose of looking at the full load state which is the context here, as shown above there is only one voltage that matters. job wrote: Technically, under-volting (or over-volting), is using a voltage which is below (or above), that found in the VID table. As such, i'm not under-volting my CPU. 1.25V could actually be considered on the high side, but my cooling is up to the task and it's also running adaptive voltage so it only gets given 1.25V when it requests it, i.e. at high load, so all is well. If you have changed a setting away from that which is hard coded for that frequency then you are either over or under volting it. It’s bizarre to say anything else for me! Man, you have a awesome workstation! I wish i could get this. What is the price of your setup today? Agharta wrote: For the purpose of looking at the full load state which is the context here, as shown above there is only one voltage that matters. He is the 7900x at full load with all cores locked to 3.3GHz (which is bare bones stock), whilst honouring each cores requested VID value. job wrote: He is the 7900x at full load with all cores locked to 3.3GHz (which is bare bones stock), whilst honouring each cores requested VID value. What software is showing that info? As part of Intel's Turbo Boost Max 3.0 they rate each core and the top two get preferred status which can lead to higher boost speeds for loads that require up to 2 cores. So as part of that it makes sense that they rate each core with its own voltage. But I still haven't seen any hard evidence that they will run all cores at individual voltages at full load. No offence, but a cropped image of an unknown utility is not evidence as I've seen so much bogus info reported by such tools. But Intel did bring the VRM back on to the chip for SkyLake X so maybe that is how they have managed to add up to 18 individual voltage planes just for the cores. If you are correct then kudos to you as I have not seen this mentioned in any reviews which is a surprise considering what a big change it is. The current 8th generation Coffee Lake chips don't support individual core voltages but Intel may have felt the need to add this to the server chips. I am only understanding about every tenth word/concept but it is always fascinating to read people who really know what they are talking about. It might help to remember what these terms are. VID is a table of voltages, and we can view it as 'the voltage that my cores request and use straight out of the box if i don't touch anything'. Vcore is the current voltage being sent through the CPU, and is quite often displayed by way of taking Vccin and dividing by 2, although not always. Displayed VID value comes from a CPU sensor, it's read from the pins and is what the cores request and use when left to their own devices. Vcore is a motherboard sensor (or user implemented), and is the voltage that's currently going through the CPU. If we change Vcore, then that particular voltage that we set becomes a target to achieve. In the screenshot above i haven't done any of this, i've lock all cores to 3.3GHz and then allowed the CPU to do whatever it wants to do electrically. Therefore, the cores are using VID values. Yeah, frequently annoying. A lot of the time you can still drop various voltages at stock, shave off 10 degrees and still pass a 24-hour burn test. Talk about them playing it safe with the factory settings. Also for a period, those same firms used to boost the default buss clock ratio to 103:100 for no real reason, other than it put them a fraction ahead of other firms in various mag benchmarks. The number of early PCIe cards it used to trip up was painful for a time given they didn't give any real warning of this anywhere. I noticed that AVX512 can process 32-bit data types so in theory it could be used to accelerate audio tasks. Afraid not, my knowledge of that is a little scant. After seeing AVX testing cook my desk during the initial round of testing, I really wanted to know if running real-time code would hammer the rig in the same fashion as the synthetics. I made contact with Melda over it who have always noted that they use the extra instruction sets where performance can be leveraged and tried to suss out with them if anything in the real world was likely to hit that sort of level. The conclusion was that the code runs in bursts as and when it's needed, so no, at this point heavy continuous use of it wasn't really something we'd see in the audio field, at least in the short term and that it shouldn't be a concern outside of those synthetics. So far that has proven true, although that's not to say it won't change in the future and of course if anyone knows of a package out there that will take advantage of it in a more demanding fashion, I'm all for giving it another thrashing! 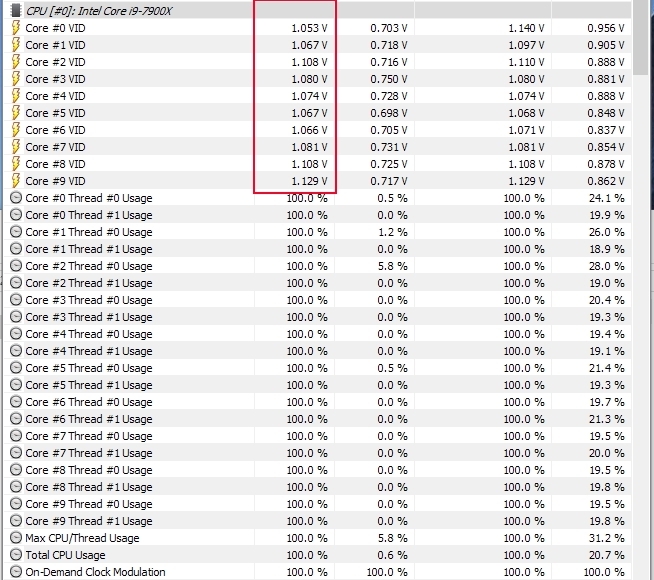 job wrote: For example, the requested Vcore on one of my 7900x's cores under turbo boost was 1.37V. However, it can run 4.5GHz at 1.15V and 4.8GHz at 1.25V, which is currently where it's at with adaptive voltage. So it's running at a higher speed and at a lower voltage than it would be if the user wasn't in charge. As for motherboards auto-overclocking the hardware as some kind of feature, I would agree that the default setting should be off, not on. Can't agree enough with the auto overclocking needing to be off at default. You've also nailed the Vcore voltages that tripped me up initially. As you say, when you run the voltage measurements at stock and see 1.35v, you really don't tend to expect it to be running stable at 1.15v after clocking it upwards! mozart999uk wrote: Thanks Pete. Really interesting. All sounds good. Can I get in touch with you via email when I'm ready to order ...to thrash out the spec? Sure, my mail hasn't changed if we exchanged them last time, otherwise, nudge me over PM and I'll update you with my latest when the time comes. Agharta wrote: I like to see under-volting but there isn’t the interest in it that is seen with over-clocking so you rarely see it in reviews. Some chips are binned very aggressively meaning that they ship with very little headroom for over-clocking. To be fair thats pretty much covered by the "S" and "T" editions of the chips to some degree as those tend to offer lower voltage editions of popular chips. You could grab the "k" and undervolt, but then the "T" edition is normally cheaper anyway. Pete Kaine wrote: To be fair thats pretty much covered by the "S" and "T" editions of the chips to some degree as those tend to offer lower voltage editions of popular chips. You buy the K version because you want the higher performance so the 35W chips aren't going to cut it. So by under-volting you make it easier to cool the CPU silently which shouldn't be that hard for a chip rated at 95W such as the i7-8700K. I think under-volting is more critical when using the 125W CPUs and you can always drop the clock a bit as well as under-volting. Wider and slower is usually the way to go for power efficiency which is what counts with quiet computing unless you must have the highest clock speed which some prefer. So a 10 or 12 core under-volted, maybe with the speed reduced by a few hundred mega-thingies might be optimal. I haven't seen any data on these Sky Lake X chips under-volted. My PC is 6 years old (Windows7/64,i5-2500k,16GB RAM) and has been rock solid. I would have replaced it by now but unfortunately Windows 10 is a problem for me. I find it completely unacceptable for an OS to install updates automatically and so far have not been prepared to invest the time in working out how to prevent this. There are many times in the past few years where being able to choose not to install or delay an update because they were unwanted (Windows 10 nag updates etc.) or broken has been important to me. I don't want to take the risk that something breaks without me being aware of the exact changes that could be involved. I'm also aware that I have to take steps to disable W10 telemetry. And I have an ECHO Audiofire, so would have to replace that. Agharta wrote: You buy the K version because you want the higher performance so the 35W chips aren't going to cut it. Well, yes, but the current chips are pretty close together performance wise and if you underclock, well, you won't get much savings, at least on the current chips. The last score is CPU benchmark average, we're looking at about 7% between them for that 35w difference. If you talk about underclocking the 8700K and dropping a 100mhz here and there, you're going to be seeing the same performance very quickly without experiencing any other real gains. Chances are the's a bigger difference between the 8700T and standard, but I've still not seen one of those physically at this point, and benchmarks are otherwise sparse. Silently? I can count on one hand the number of passive coolers left out there and on 2 fingers the number that can cool over 85w. The best commercial (ruling out the crazy french custom solutions) one I'm aware of is the nofan 95 and that does 95 degrees. The problem is that the K when it turbos the cores goes above a 95w pull. Sure, you can undervolt and put it to a locked 8700, but then you might as well save the money and just buy a 8700 and go with the 65w edition to give you more headroom. Or you can fit a cooler that's rated to 220W and run it at half speed. It's not to say I don't agree with some of what you're saying, I just don't think it get's you the benefit in the mid-range anymore, not when you can just save money and buy the cheaper, lower power model and still get 95% of the performance of the upper model with none of the cooling concerns or having to piss about getting it stable. On the other hand, I'd agree with the i9's and more enthusiast models where the power ramp-up is around 20% under load. Scaling that back certainly has the pro's you've already listed.